This year’s annual Divine Mercy Lenten Retreat will be held at St. Leo the Great Catholic Church, Fairfax, Virginia from March 2 to March 4, 2018. 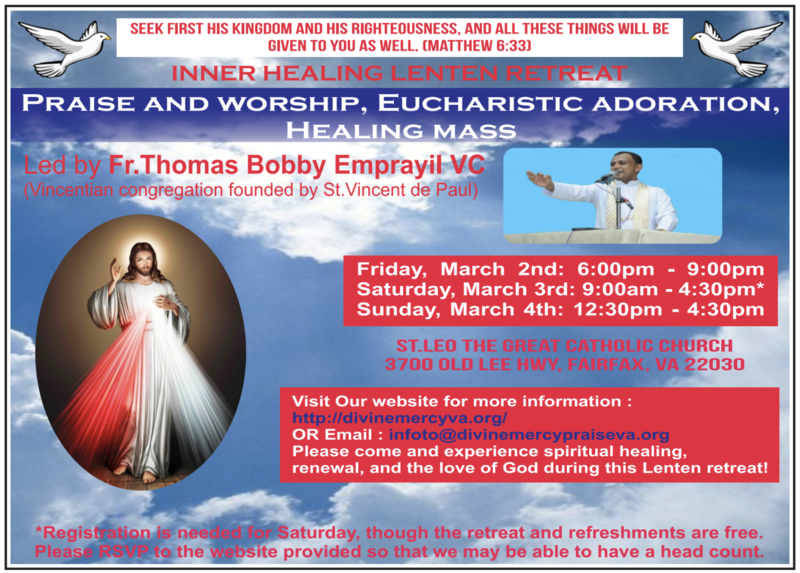 The Retreat is led by Fr Thomas Bobby Emprayil VC and will include Praise and Worship, Confessions, Healing Mass and Eucharistic Adoration. Fr. Bobby is a member of the Vincentian Congregation that has established retreat centers in India and around the world. He is the Director of the Divine Renewal Retreat Center in Margherita Assam. Come and experience the spiritual renewal & the love of God during this Lenten season! Registration is free. Please sign-up as early as possible.